CCP DECLARES: ON THE NATURE OF THINGS PRESENTED ITSELF AS A ‘STATEMENT’ EXHIBITION THAT EXEMPLIFIES THE STATE OF CONTEMPORARY AUSTRALIAN PHOTOGRAPHY. THE WORKS WERE LOOSELY UNIFIED BY A FOCUS ON THINGS: AS SUBJECTS OF PHOTOGRAPHY OR THROUGH PHOTOGRAPHY’S CONSIDERATION OF ITS OWN MATERIALITY. THIS THEME BELIED A DEEPER CONSIDERATION OF PHOTOGRAPHY’S EXPANDED FIELD, OR OF ITS RELATION TO WHAT EXISTS BEYOND THE IMAGE. 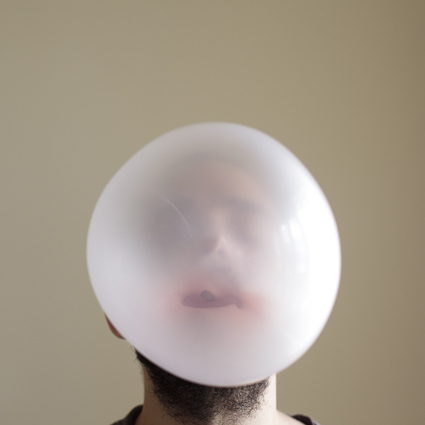 Yavuz Erkan’s Unorthodox Aphorisms series uses things to create synaesthetic encounters that fire the senses and short-circuit the act of seeing that governs photography. These works mostly show the artist in staged interiors performing deliberate gestures with single props. Though employing Erkan’s gauche body and unusual situations to effectively confound our expectations of photographic display, the most striking thing about these scenes is their delicate sensuality. In one image, the folds of a towel wound around the artist’s averted head introduce a hint of texture and tactility. In another image, the immersion of the artist’s hand in a glass of snow white milk emphasises the liquid’s creamy viscosity. If an aphorism is a saying that is supposed to express a truth, in Erkan’s photographs this truth is not thought but lived, grounded in the body’s experiences and impurities. Amy Marjoram’s Cloud Series 2010-2012 comprises shots of a cloud scrawled in black permanent marker on a window. The artist’s winsome drawing becomes a fetish that imbues an otherwise unremarkable view with quiet fascination, its presence rendering the trails left by water on the window’s greasy pall of dust in a work like Untitled 2 mournful or almost lyrical. The choice to include her looping Swanston Series 2009-2010 on a digital photo frame was curious, as these albeit intriguing works seemed incongruous next to others. Marjoram’s work leads into Nasim Nasr’s nine-channel video installation, What to Do? in which each screen shows a different set of hands working a string of worry beads accompanied by the sounds of prayer. The fetishisation of this object in male hands linked this work to Marjoram’s and alluded to the fraught politics of the Middle East, though the beads’ endless vacillation also makes the work’s strength—its ambiguity—its weakness, by undermining any cohesive political message. Nevertheless, the pervasiveness of the work’s quiet susurrus through the gallery space captures the everyday anxiety that motivates such rituals. In Andrew Hazewinkel’s Head Replacement Therapy: (plundered #1-#6), the belatedness of documentation—the way it captures an object whilst also signifying its absence—is used as a resource. His six photographic objects are 19th century negatives of damaged classical statues screen printed on backlit glass, each with a thin slice of agate placed where the statue’s head would have been. This simultaneous act of restoration and defacement highlights the uncanny effects of disintegration, making us acutely aware of how wound-like each rough patch of broken marble seems. Hazewinkel’s acts of archival plundering exploit his source photographs’ strangeness and untimeliness, transforming documentation into work with its own singular mystery. It is this concern with the singular that brings Hazewinkel’s work into dialogue with Jane Brown’s nearby suite. Her small prints show monochromatic, precisely composed scenes. The absence of human presence makes them acutely evocative of the passing of time. Empty, they become memorials created in anticipation of the inevitable expiration of the places they depict. In Brown’s work it is perhaps the photograph itself that foregrounds its status as thing, becoming a material remainder of a moment long passed. A focus on the photographic product also motivates Jacky Redgate’s work. Her large format photographs from the Light Throw (Mirrors) series problematises the idea of a subject of photography. Constituted by complex combinations of objects, mirrors, reflections and sources of light, the images in this series refuse to resolve into comprehensible layers. Zones of intensifying shadow, the imperfect forms of card cut-outs and fields of colour created by blue and yellow plastic trays in Light Throw (Mirrors) #9 draw the eye into a dynamic compositional play propelled by uncertainty, constantly inviting and deflecting the viewer’s gaze. The contained meditations of David Nixon’s Energy 2006-2012 series position themselves interestingly within the expanded photographic field on display. Each video shows a spotlit object moving in darkness: the sinuous motions of a feather boa; neon green tinsel reminiscent of scratched film; water-like polystyrene spheres. Though these objects are banal and can be linked thematically, there is something else operating in Nixon’s series. As well as chanting, the changing soundscapes accompanying the videos include wordless voices, droning and the sounds of violins: elements that remain indefinite even as they gesture to some reality. Instead of foregrounding the meaning of things, Nixon’s videos invite us to meditate on things as they appear. The effect is, paradoxically, one of stasis, as though Energy is capturing fixed qualities in the midst of movement and change. Whereas Nixon’s videos try to seal the qualities of things in hermetic depictions, Ross Coulter’s arresting Aftermath photographs can’t be divorced from the event they document. 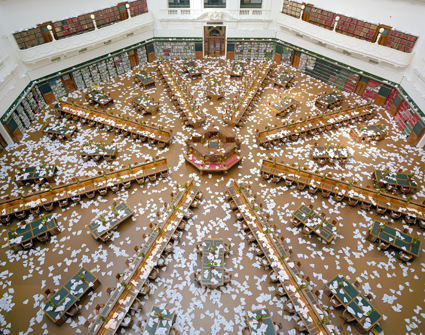 Aftermath depicts the debris of a performance at the State Library of Victoria in which Coulter had a team of 160 volunteers throw 10,000 planes from the La Trobe Reading Room’s balconies. Wanting to “capture the flight of thoughts, ideas and dreams through the library’s dome” (State Library of Victoria documentation), Coulter’s action was both whimsical materialisation of an abstract notion—thought—and a subversion of the library’s conservationist functions. Though beautiful, the grounded planes dappling the shelves are also reminiscent of a battlefield full of casualties. This focus on what remains dramatises the difference between performance and its capture, reminding us that the fleeting and abstract must also come down to earth. Brought together by an exploration of the status of the photograph, or by its relationship to its outside, the works in CCP Declares map a compelling field of expanded photographic practice. If this mix of emerging and established artists is anything to go by, Australian photographic practice is in a healthy state.